Alessi collaborate with various artists and designers from all over the world to create a huge range of iconic, whimsical pieces that belong in both a design museum and your home! Designed by Piero Lissono, the Birillo Soap Dish is unlike most other soap dispensers you’ve ever come across… after all, how many soap dispensers are designed by the same mind sets that go into making hotels, yachts, public buildings and private residences? 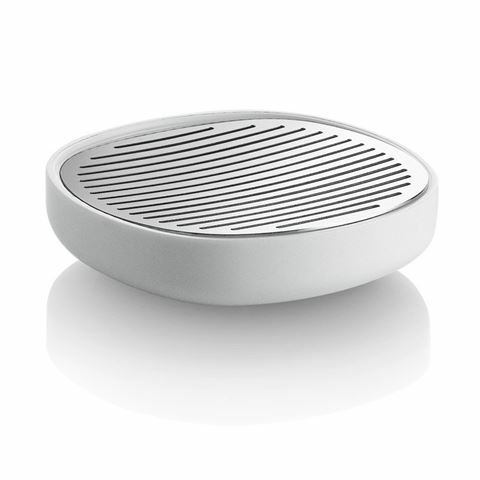 Well, the Birillo Soap Dish is one such object; designed by Piero Lissoni, an architectural genius out of Milan, Italy. Simple but never dull, this soap dish is crafted from solid white acrylic, with an 18/10 stainless steel grate that drains liquid from your soap bar. Its minimal shape and clean material is its focus, and it’s easily paired with other Birillo pieces. Designed in Italy by Piero Lissoni. Made from solid acrylic, with an 18/10 stainless steel grate. Stainless steel grate drains liquid from soap into the base. Dimensions: 11cm (w) x 3cm (h).